Congratulations to Sue of Cronulla, who is the winner of the 6th weekly draw for the Adult Summer Reading Club, 2012-2013. 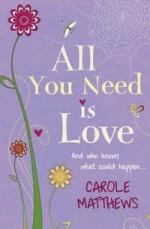 Sue read "All you need is love" by Carole Matthews. About a single mum Sally, who lives in a run down council estate. Meets a rich man at a computer course. Sally, sick and tired of living in an unkempt estate, decides to do something about it, and with the help of her friends, gets a grant to clean up the estate.